I strongly recommend that all college preparation work - standardized tests (ACT, SAT & SATII, TOEFL, etc. ), applications, essays, LOR’s, portfolios, videos, school activities etc., be completed during the 11th grade. To delay will most certainly be costly! For the family already involved in the program, this will be a piece of cake. For the uninitiated, it will be an overwhelming experience. But don’t worry; I’ll walk you through it. 1. Prepare to take language three. 2.Join one or two more clubs, unless doing so will cause students to spread themselves too thin. 3.Volunteer for more community service hours - there can never be too many. 4.Take a prep course for the PSAT, SAT or II and/or the ACT. a. Safety Schools - Schools where the student is 100% qualified and their numbers are in the top 10% of students admitted the previous year. Apply to two Safety Schools. b. Mid Range Schools - Schools where the student is qualified and their numbers are in the top 25% of students admitted the previous year. Apply to two Mid Range Schools. c. Reach Schools - Schools where the student just barely qualifies. Apply to one or two Reach Schools. d. Cost Effective Safety Schools - 100% affordable Safety Schools, where the student must be willing to attend. Apply to at least one Cost Effective Safety School - applying to two is safer. 7. By now, students should be picking the brains of several seniors. 8. Continue to nurture relationships with guidance counselor(s) and teachers to obtain outstanding LOR’s. 9. Review additional college applications. 10. Continue writing practice essays. 11. Students planning military careers should narrow down their list of schools that participate in an ROTC program. It’s time to make a formal request of the US Senators and Congressmen contacted in earlier grades. Call them to find out the proper procedure to obtain their recommendations. At this point, it should be quite evident that there is a tremendous amount of planning that must be completed prior to the 12th grade! To attempt to cram all of it into a period of a few months at the beginning of the senior year, without professional help - is a virtual impossibility! Even if the student is primarily applying to state schools having fewer requirements than most private colleges, it will still be a nightmare. •Confirm that school is in session and that everything you plan on visiting will be open. •Confirm dates and times at least two weeks in advance. •Schedule a meeting with the admissions staff. Stay in touch after visit. •Schedule meetings with professors in the student’s areas of interest. Stay in touch after visit. •If the student’s course of study has been decided, he or she should try to arrange a meeting with the head of that particular department and audit a class or two. •This may require an overnight stay that will allow students to check out the dorms. •Schedule a meeting with the financial aid office. Be brief and do not volunteer any financial information. •Bring an audio or video recorder and a note pad. •Find out who reads applications from your high school and try to meet with them. If so, stay in touch after the tour. •Athletes should schedule meetings with a coach or two. •Listen to the school radio station(s) and get a copy of the campus newspaper(s). •Visit some frat or sorority houses. •Students should pick the brains of those already matriculating. •Try to get into a dorm or two - unannounced. •Have a snack in the cafeteria. After all, their food is what will be filling your stomach for the next four years. 1. What is the average percentage of financial need that your school meets? If less than 100%, ask if there is any way it can be increased. 2. How does your school determine unmet need, and what is the average percent unmet? 3. Do you cap the amount of financial aid given out? If so, at what amount? 4. All things being equal, can we expect the same aid package for all four years? If not, how much less should be anticipated? 5. All things being equal, if our financial situation weakens, will we be assured of increased aid in the ensuing years? 6. What’s the cutoff date for receiving financial aid? 7. If we don’t apply for financial aid in year one, will we have any problem receiving aid in years two or later if we qualify? 8. If our student receives a scholarship from a private organization for community service, scouting, etc., will that affect his/her financial aid package? 9. Are any merit-based scholarships need sensitive? 11. How does your school assess home equity? The possible answers are: (a) It doesn’t, (b) at 2.4 times income (IM maximum), or (c) at full value based on the Housing Index Multiplier (HIM). Note: Home equity in the IM is capped at 2.4 x total parent income. Business assets are assessed on the first $95,000 @ 40% x 5.6% = $2,128. If the net value is over $95,000, the assessment starts at $38,000! If you don’t get satisfactory answers to the previous questions, and unless money is no object, you really need to think about another college! Warning! Never, I said never, not even for a single minute should you lose sight of the fact that no matter how polite they are, no matter how sincere they seem, no matter how helpful they prove to be - the loyalties of FAO’s are with their schools - NOT with their applicants! Philanthropic is not a word you will find on their job description. I am certainly not suggesting that you lie to an FAO, but I cannot stress this enough: DO NOT volunteer financial or any other information that could come back to haunt you! Pick their brains, answer their direct questions truthfully and cautiously, but otherwise - keep your mouth shut! This is a limited-availability program involving a select high school and a local college or university. High school teachers are the instructors, but the participating Co-op College oversees the final exams. A separate transcript is generated and a college level grade is earned. Check with your guidance counselor(s) to see if your school participates. This is a similar program where a college level grade is also earned, except that the student is attending class on a college campus. A high school guidance counselor is needed to coordinate scheduling of the program. It is not recommended that more than two college level courses be taken in any one semester, unless the student is an absolute genius, in which case, you may want to consider Early Admission on page 48. A highly advanced course of study requiring a sponsor, usually a high school teacher and a college professor or other professional to act as an advisor. Students submit details of their chosen course of study, and it generally must be completed within one academic year. Once again, this is only recommended for exceptional students. If a student desires to pursue specialized or technical studies outside of classroom boundaries solely in the pursuit of knowledge, then the student should design a course of study that takes into consideration (a) The objectives, (b) The question or problem to be solved, and (c) Likely solutions to the problem. Independent Study is only for the most disciplined student who is also proficient at time management. It is most important that a complete explanation of the course work be detailed on the student’s transcript. This will be of great interest to admissions officers. Such a project sets students far and above their average classmates, as it demonstrates vision and a level of maturity surpassing virtually all their high school peers. Just the fact that a student was involved in an independent course of study will make an immense impression on the admissions officers! This is yet another way for the student to obtain college credit while still in high school and add an additional edge to their already multifaceted self. Work is completed at home and sent to the school via mail or email. Upon completion, further work is sent to the student and a proctor supervises the exams. Normally, there is no contact with anyone except at exam time, when there is a proctor. Assignments are either mailed or emailed to the student, who is given a set period of time in which to complete the work. Exams follow, and a passing grade generates more study materials until the final exam date has been set up. A passing grade equals college credit. 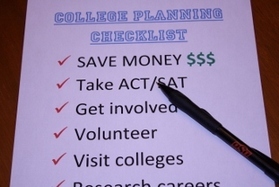 Students must budget their time in order to successfully complete any correspondence courses. Discipline, superior study habits and a burning desire to succeed are the key attributes for someone to pursue this “out of the box” course of study. Again, this is not for the fainthearted. Schools that offer correspondence courses can be found on the Internet. I suggest first contacting a local college to determine if they offer any. If so, call the schools where the student will be applying in order to make certain they will accept these credits. If not, search for schools that will participate. The Higher Education Act’s reauthorization in 1998 allowed for a limited number of IU schools to qualify for federal funding on a trial basis. Students who have excellent time management skills can earn college credits by programming a few IU courses into their busy schedules during the high school years. This is not recommended for freshman or sophomores, as the course work will most likely be too difficult. Verify with the colleges to be applied to that IU credits earned will be transferable. Students considering IU should first consult with their guidance counselor(s). The final school list has been narrowed down to 6 to 8. FAO’s have been asked all the foregoing questions and have given satisfactory answers. All schools the student is applying to have been contacted as to whether Dual Enrollment credits, Correspondence Courses, IB Exam scores, etc., are transferable. Colleges the student is applying to have verified that the AP Exam scores received or to be received will result in college credit and enable the student to avoid taking these courses again. 1. Review the transcript for errors, omissions and inconstancies. 2. You’ve visited some campuses and narrowed down your choices to 6 to 8 schools. Ideally, you paid “official” visits to some of the schools, stayed overnight in the dorms, and audited one or two classes. These experiences, good or bad, will have proven to be most enlightening. 3. Keep piling on community service hours - you can never have too many. 4. Keep working out-of-state in the summer if possible, or perhaps intern in your chosen field. 6. Continue reading in your spare time. This will increase your vocabulary and SAT & SATII English scores. 7. Continue to learn 5 to 10 new words every week. 8. As always, continue negotiating for better grades. 9. Add more Honors and AP classes whenever possible. 10. Keep perfecting your essay writing skills - they speak volumes to the admissions committees. 11. By now you should have a few great LOR’s - get some more! 12. As long as it doesn’t detract from your schoolwork, apply for private scholarships whenever possible. No matter what you may have read, it’s still like finding a needle in a haystack! 13. Last chance to take a class in the summer to get additional college credit. 14. Students planning a military career will need to apply for an ROTC scholarship at the beginning of the 12th grade. They should have better than average scores, i.e. 1800+ SAT, with an emphasis on the math score. A rigorous physical must be passed, and the interview must be “aced!” If successful, the student will receive a partial or full ride while in college, plus a $100 monthly spending allowance. 18. Stay in touch with those officials you’ve met over the past two years because they can give students a decisive edge in the admissions process.